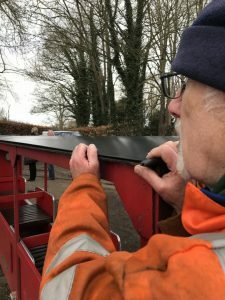 Last week our Engineers and Train Drivers worked together giving the Carriage roofs a major upgrade to new plastisol roofs. 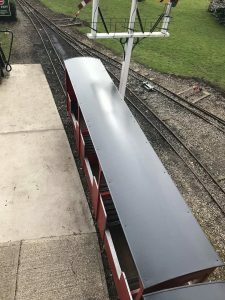 The start of many upgrades that are taking place at the Railway for 2018. The previous roofs were made from Marine Ply, which does not last and is not very durable. After time the roofs would split and rot causing them to look untidy. The roofs needs to withstand all types of weather so we looked into the different options and found the latest technology, a material called Plastisol. Terry fitting the new plastisol roofs along with the help of Darren, Kieth, Mark and John. 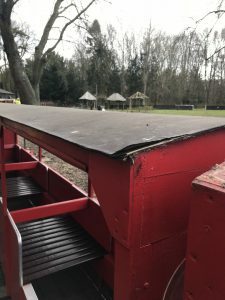 Plastisol is a plastic coated steel which has a guarantee of at least 25 years, meaning our customers should stay nice a dry for many years to come! The new plastisol roofs are wipeable and much easier to maintain. Whereas the wooden roofs needed constant painting to keep them looking tidy. It really gives the carriages a smarter look. The new plastisol roofs looking very shiny. 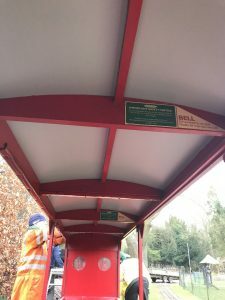 The carriages back in the station with their brand new roofs. If you would like to come and check out our brand new roofs you can see our opening times here. 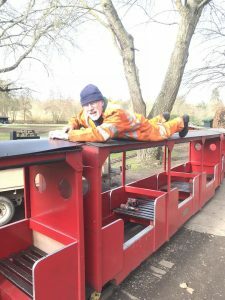 The Train allows you to travel through the beautiful Capability Brown designed Estate woodland. 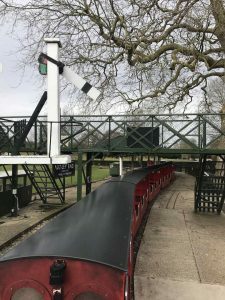 It’s made up of hundreds of magnificent trees and packed with wildlife from birds, to squirrels and even the rare Muntjac (a tiny Deer), so be sure to keep your eyes peeled as you travel around the private 1.5mile track. You could also visit us for one of our many Special Events throughout the year. More information here.